A good night’s sleep with neck pain is almost impossible—or is it? Many people with neck pain are able to sleep as soundly as a baby. Their secret: a good cervical pillow. 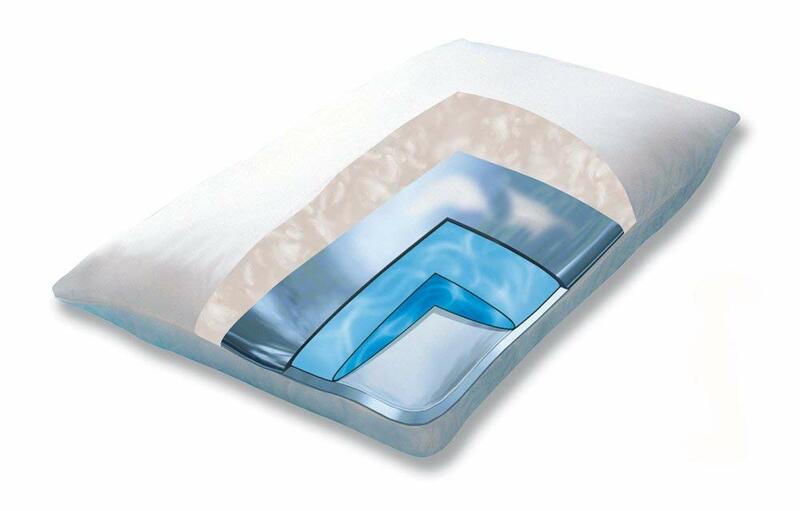 And one type of cervical pillow is a water pillow. Sound crazy? It’s not. Check it out. What is a water pillow and how does it work? Think of a water pillow as a two-compartment pillow. The lower part is water and the above one is memory foam or polyester foam or synthetic down. The water pillow is able to provide better neck support two ways. You can make it as firm or soft as you want. Your pillow should fill the cover of your neck perfectly—even a few inches more or less can make a big difference, especially if you already have neck pain. If the pillow is too thick, your neck will prop up forward. This is not good for your neck, as in this position undue strain is put on the C7 (that is, the base of the neck, which is where the majority of neck pain patients experience most pain). When the pillow is too thin, your head sink down more than it should, disturbing the spine, neck, and head alignment. And often it is the neck area again which bears the brunt of this misalignment. It contours to your head and neck really well. When you put your head on the water pillow, it displaces the water, creating a niche which, while softly cradling the head and curve of the neck, helps the pillow provide adequate support. When you move around on the pillow, the water moves with you. Therefore, you get the same level of support and comfort in every sleeping position. Is cervical pain relieving quality of the water pillow scientifically proven? 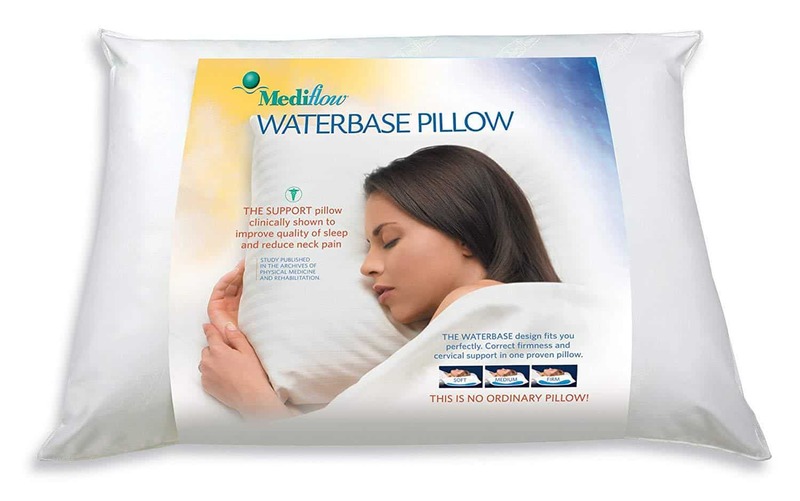 One study, conducted way back in 1997 by the John Hopkins University of School, concluded that the water-based pillow was associated with increased pain relief as well as improved quality of sleep (and manufacturers since then have been consistently highlighting this fact). No more studies, at least none reported by reliable sources, have been conducted after this one. Do water pillows get cold? The water chamber in a water pillow is enclosed by a therma-shield, which prevents any heat transference from your head to the water layer and vice-versa. So, water pillows are less likely to get warm as the night passes than some other pillows. However, to say that they are cold will be an overstatement. Some water pillows use gel, which improves breathability and makes the pillow a little cooler than it would be otherwise. If you are a hot sleeper, you might want to try this type. It might keep you comfortably cool. The other option is using a pillow designed specifically for night sweats or a cool pillow mat. Are they hypoallergenic and machine washable? Water pillows are low-maintenance pillows. You can wash the pillow in the machine when you change the water or any other time. As to how often you should change the water, well, most recommend at least once in 12 months. Most, but not all, water pillows are labeled as hypoallergenic. If you suffer from asthma or are prone to allergies and want to try a water pillow, opt for one that is clearly classified as hypoallergenic. They are heavy after you fill the water. A fully filled pillow can weigh as much as 15 pounds or even more. You certainly wouldn’t want to move it around much after you’ve filled it (but you can use them as weights for building biceps!). They can make some noise when you move around. Does that mean you must stay put in one position all night? Well, not really. This pillow uses a down layer over a water base—a combination that is not very common. It is as comfortable as any quality down pillow, but its added advantage is that you can adjust the thickness. The adjustable thickness feature can be vital for cervical pain sufferers, who need their pillows to be of a particular thickness; anything more or less and they will not get the best support and relief from their pain. You might want to check this Mediflow pillow if you love down pillows but also want customizable thickness. The down filling used is hypoallergenic. Asthmatics and allergy-prone people can use it without a concern. The cover is 100% cotton and give a soft feel when you lie on it. It accentuates the comfort factor of the pillow further. Mediflow pillows are made in the USA, and this one is no different. I like to buy homemade products. If you are like me, you’ve another reason to check it out. My only gripe is that some standard pillow cases do not fit it. I used a high-end oversized pillowcase for it. You might want to do the same if you decide to buy it. The top of the pillow is made of hypoallergenic fiber (good news for asthma sufferers wanting to use a water pillow) and is comfortable to lie upon. Underneath it is a water pouch, which you can fill up according to your preference. 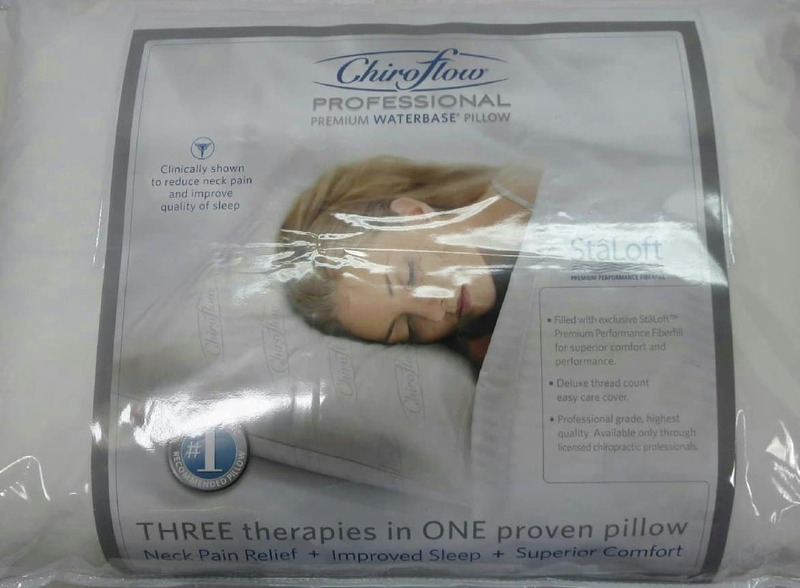 The Chiroflow pillow is suitable for both back and side sleepers. The pillow provides good support to the neck and maintains the neck, head, and spine alignment. If you have neck pain, recent or chronic, you might want to use this water pillow. There is a thermal insulator surrounding the water pouch, which keeps heat loss to minimum. This pillow is not cold by any stretch of imagination, but it is certainly comfortable. While there’s no mention of it being washable in the product description, I’ve washed it several times in the washing machine without a problem. Just remember to empty the water completely. This is a good water pillow, and the only small issue I could find was that it becomes rather heavy after filling water, but then which water pillow doesn’t. This Mediflow Pillow is soft, supportive, and cool—and that’s no mean achievement. (There are pillows with one or two of these qualities, but not many pillow with all three). The pillow uses a foam layer over the water pouch. These two layers work together to give you comfort and support. While memory foam gives the pillow its softness and allows it to support your head and neck, the water layer ensures that the pillow is as thick and firm as you want it to be. Those having neck pain might benefit from sleeping on it. The gel, on the other hand, keeps the pillow cool. Typical﻿ M﻿emory foam pillows can let heat buildup, and some users, even though they like the support this material offers, don’t use it because of this. If you are one such person, you might want to try this pillow, as the gel particles keep it comfortably cool all night. The pillow is made in the USA, which can be an additional advantage for some. However, there is no information about it being machine washable and hypoallergenic.